Class A Motorhomes are plenty huge, but as bone stock from the factory they can definitely use an improvement in engine performance to match that size. Thatï¿½s where Stage 3 Motorsports can really help out. Replacing some of your restrictive, power-robbing components with high-performance parts can give you that extra horsepower and torque you need to get your RV powering up steep grades while towing a heavy trailer without having to downshift and the kind of throttle response necessary for getting up to highway speeds and merging on safely. With more than 50 years of real-life research and development, Banks Power knows what it takes to improve fuel economy, horsepower and torque so that when you hit the gas pedal of your Motorhome youï¿½ll consistently experience the kind of dependable performance you need on those long journeys. What Is Motorhome Custom PCM Tuning? A great way to start instantly seeing improvements in fuel economy, horsepower and torque for towing capacity is to optimize your engine with one of our custom tunes, developed specifically for your Motorhome. 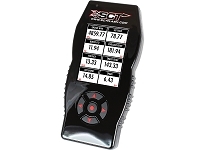 Our process starts once you purchase your SCT Livewire TS or X4 handheld unit and tell us some specific features that make your RV unique (make, model, upgrades, aftermarket modifications, etc.). We then prepare a custom tune that can now be communicated directly into your Motorhomeï¿½s onboard computer via the handheld tuner to relay those newly improved changes. Within a couple minutes youï¿½ll be able to start experiencing better towing capabilities, improved fuel economy and much better pick up as soon as your foot hits the gas pedal. And if you ever want to switch back to stock settings, it can be done just as easy. 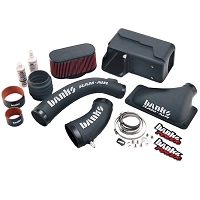 What Makes A Banks V10 Ram-Air Intake System Better Than My Factory Unit? One of the quickest ways to get your 6.8L V10 to outperform its current levels is to breathe in larger amounts of air at cooler temperatures and at a faster rate. 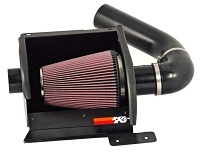 Your factory stock intake system is made up of restrictive components that not only slow down this process, but also contains an inferior disposable filter that can allow in harmful particulates that create problems down the road. 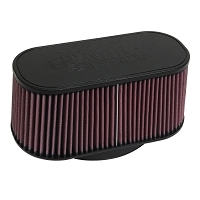 By utilizing massive intake tubes and an over-sized air filter, the Banks V10 RV Ram-Air Intake pulls in massive amounts cool air and keeps out those harmful contaminants at the same time. One of the best features is the large 8-ply, reusable filter which is washable and reusable, saving you money on regular maintenance down the road. How Does A Banks Torque Tube Manifold System Work? 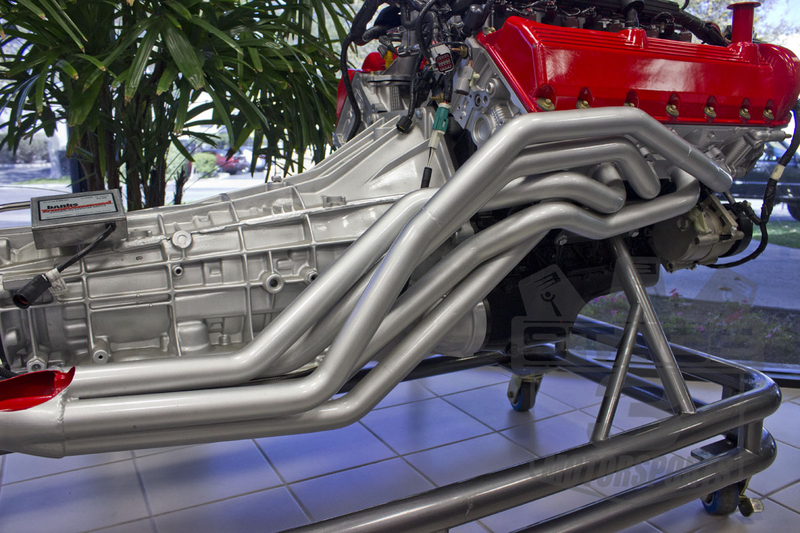 One of the most powerful upgrades you can make to improve your V10ï¿½s performance is this Torque Tube Manifold System. Factory exhaust systems can choke airflow and rob your engine of performance. 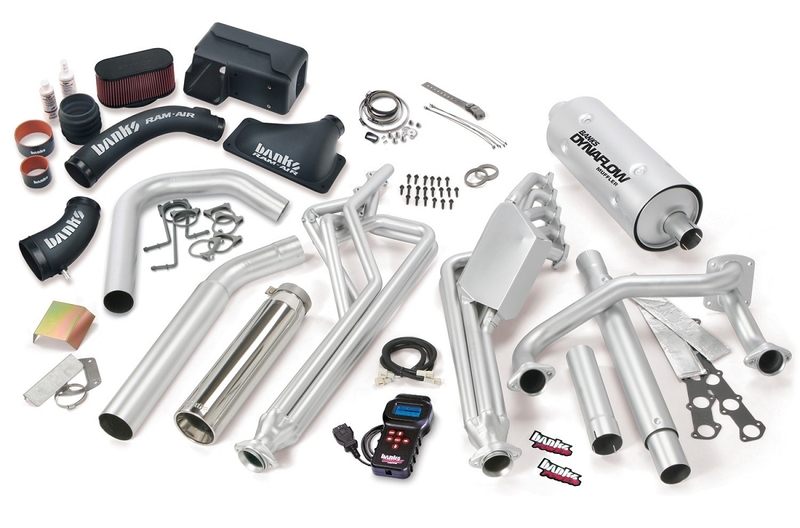 The RV Torque Tubes come in a set of 2 and each uses 5 free-flowing long tubes that meet at their patented PowerPickle collector system, which creates a rotational firing order to maximize the way exhaust is extracted. 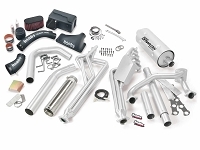 This method was designed to overcome the restrictions found in factory stock systems and extracts massive amounts of exhaust at a higher rate. 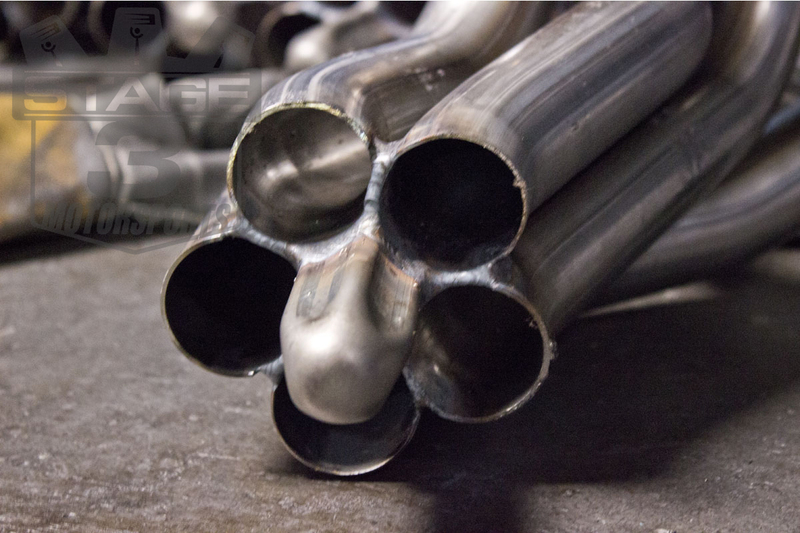 Your Torque Tubes work to create a much greater amount of torque which equals increased hill-climb speed, fuel economy, acceleration and rear wheel horsepower. Just as important as it is to get higher amounts of air flow into your engine at cooler temperatures with the Ram-Air Intake System, itï¿½s equally important to get that air out of your engine after itï¿½s done its job. 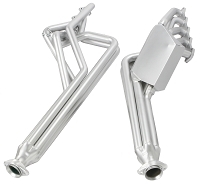 Thatï¿½s where a high-performance exhaust and less-restrictive muffler come in. 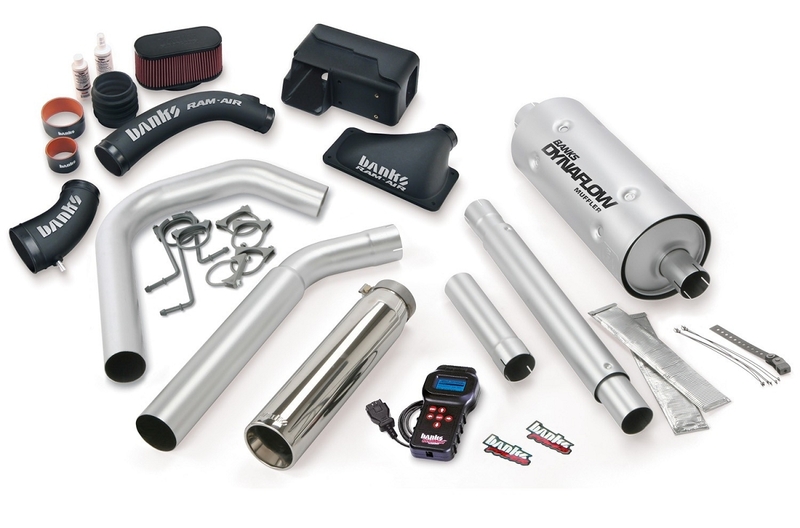 The free-flowing DynaFlow Muffler works to release backpressure while the Banks Monster Exhaust uses 4ï¿½ Stainless Steel tubing which enables air to flow out at a much faster rate. 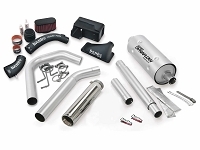 The system looks great on your RV as well, as a beautifully-polished 5ï¿½ stainless steel tailpipe tip exits at your choice of either the right or left side. What Can A Banks Power Pack System Do To Help My RV? The engineers at Banks have already done the hard work for you by conducting years of real-world testing on their products to make sure they will increase the performance of your Class A Motorhome. 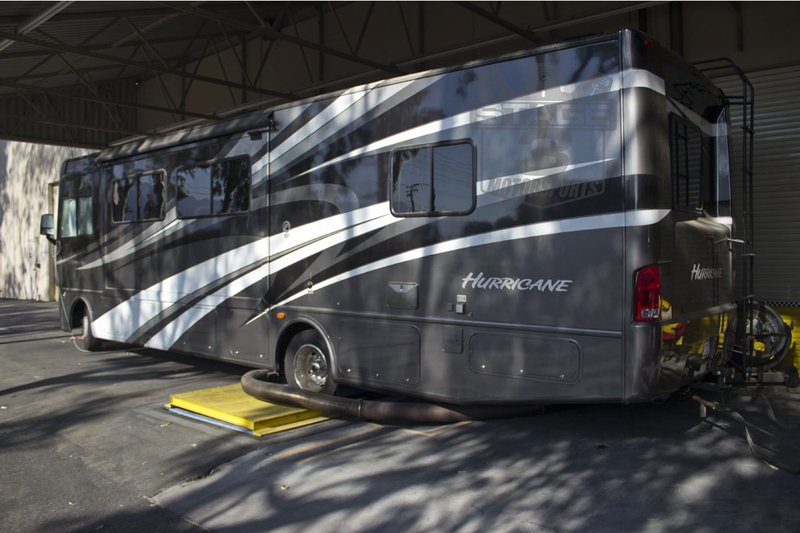 They start by taking a full-size Class-A Motorhome with a full weight configuration and test it on the road as well as back at the factory using a chassis dynamometer to benchmark the vehicle and its results. What Is The Difference Between The Power Pack And Stinger Systems? The Power Pack has been shown to deliver 26% more horsepower and torque to your 6.8L V-10 engine: up to +56 hp and +70 lb-ft of torque at the rear wheels. This enables you to easily cruise up 6% grades 12% faster. As for speeding up to safely reach highway speeds or get up to speed to pass a slower driver, the Power Pack has been shown to chops three seconds off your 0-60 mph time. With PowerPack's engineered intake and exhaust upgrades plus calibrated fuel tuning (optional), your rig will pass and merge a whole lot easier and more safelyï¿½and you'll get up to 7% more MPG. This is done with a combination of their 5-tube Torque Tube exhaust manifolds, low-restriction Dynaflow muffler, 4ï¿½ Monster Exhaust with a 5ï¿½ polished chrome tailpipe tip, Banks Ram-Air Intake system and AutoMind Programmer. The Stinger System contains all of the same high-quality parts in the Power Pack, but without the Torque Tubes. Designed for the budget-minded, the Stinger System still gives your RV some amazing results, but without a little less than half of the performance results. The Torque Tubes can always be added at a later date, if necessary. The beauty about all of the high-performance Banks components is that they are all built to be installed onto your motorhome with precise factory OEM fitment. 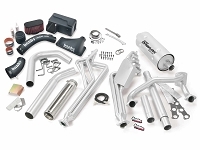 From the AutoMind Programmer and Ram-Air Intake to the Monster Exhaust and Torque Tube Manifold System, Each of these parts can be installed by a professional in your local area. Each part comes with all of the hardware and detailed instructions needed for a straightforward installation that can be easily done by your local RV dealership or favorite repair shop in your area. Whether you decide to start with Custom PCM Tuning and a Banks Ram-Air Intake System or go for the ultimate in maximized performance for your RV with a Banks Power Pack System, youï¿½re sure to experience some amazing results that will keep your driving experiences fun and safe wherever you travel.